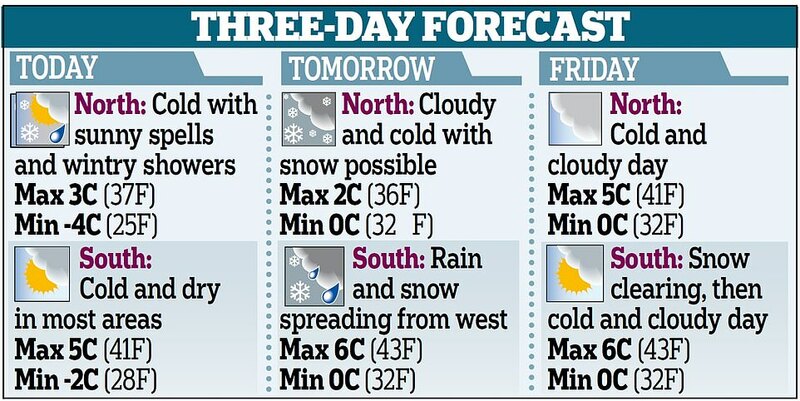 Flights have been grounded, roads blocked and schools closed today as whiteout Britain is gripped by a deep freeze – with temperatures expected to fall to -11C (12F) and ‘very significant snowfall’ still on the way. 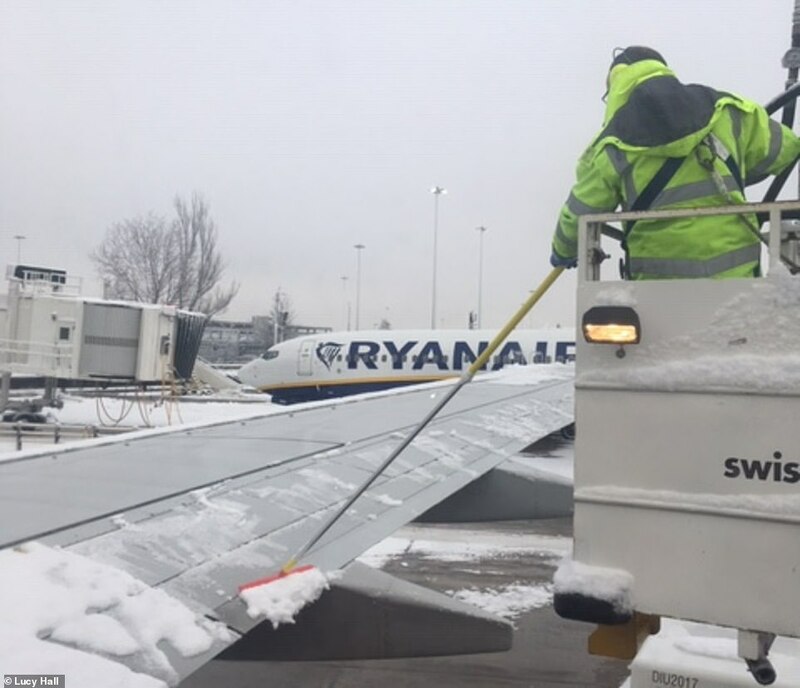 Manchester Airport was closed until lunchtime as workers desperately tried to clear the runway of snow, with passengers complaining of ‘mayhem’ as people were stuck on planes and flights redirected to other airports. 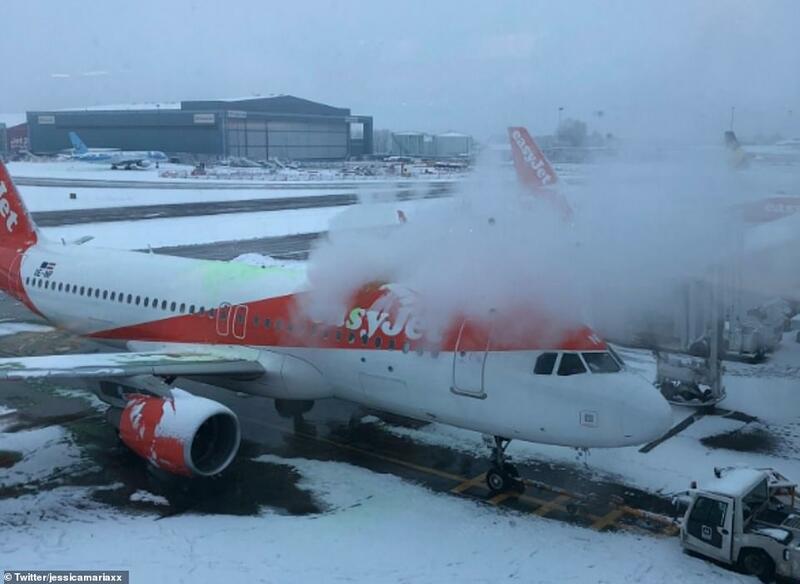 Liverpool Airport also temporarily halted flights. 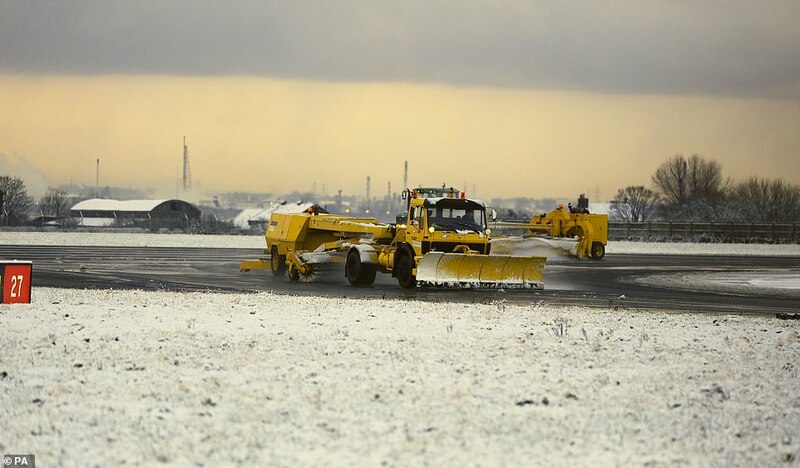 The airports, which faced disruption despite warnings of snow by the Met Office, both insisted their airfield teams had worked through the night to try to keep the runways clear. 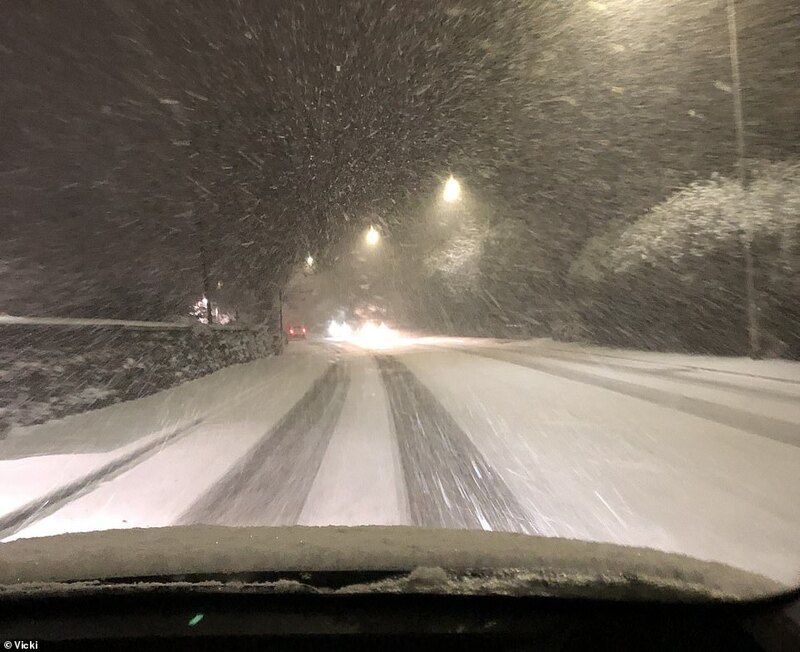 Some 115 schools were closed across Greater Manchester today, mostly due to the dangerous road and pavement conditions – including at least six in each of Bolton, Bury, Oldham and Stockport – plus another 11 in Staffordshire. 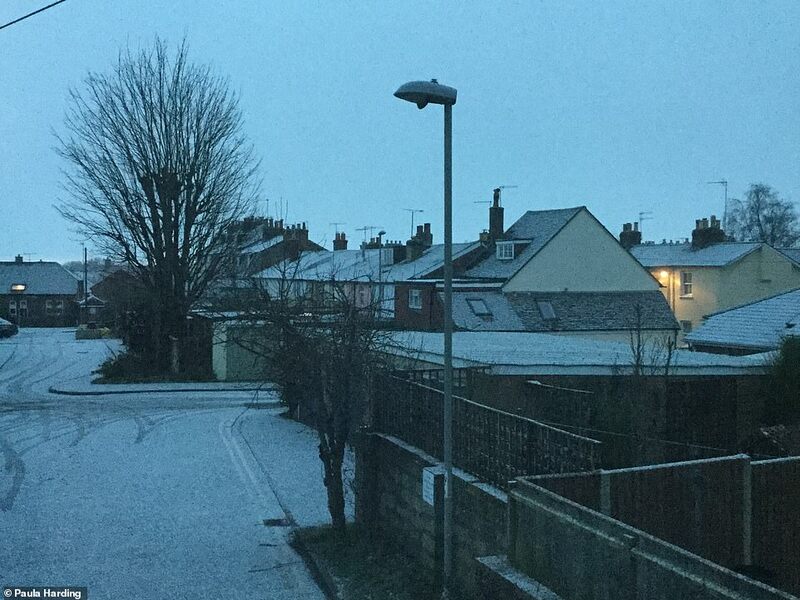 Various other schools have closed around the UK today. 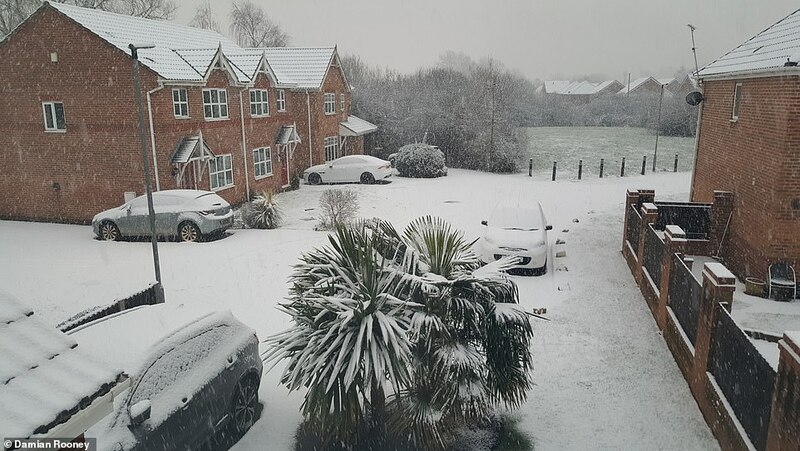 Much Woolton Catholic Primary School near Liverpool announced its snow day on Twitter, asking for ‘creative ideas’ to make the most of a blanket covering the grounds. 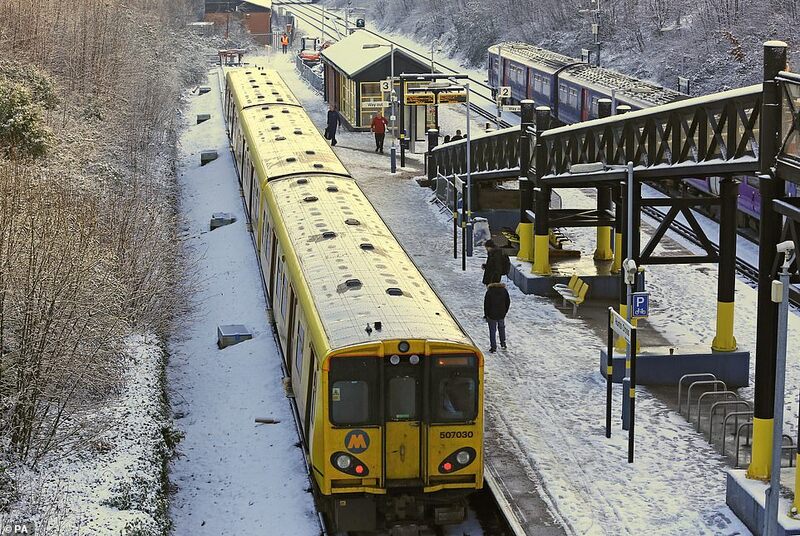 National Rail warned some train routes may need to run to an amended timetable if conditions worsen, with Southeastern already announcing it will implement an emergency timetable on Friday due to the bad weather. 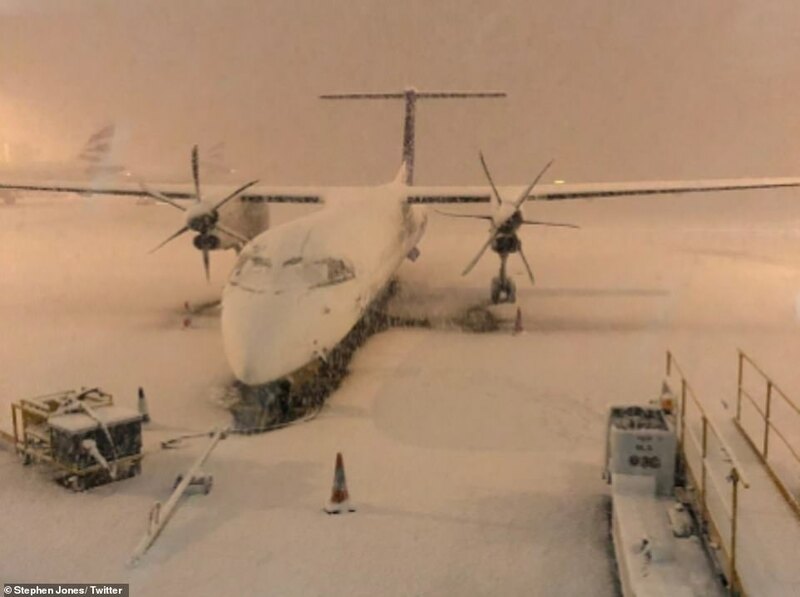 A storm in France teamed with Arctic winds from the North Pole have led to flurries and sub-zero conditions in the UK, with Transport for London activating their cold weather strategy and running de-icing trains overnight. 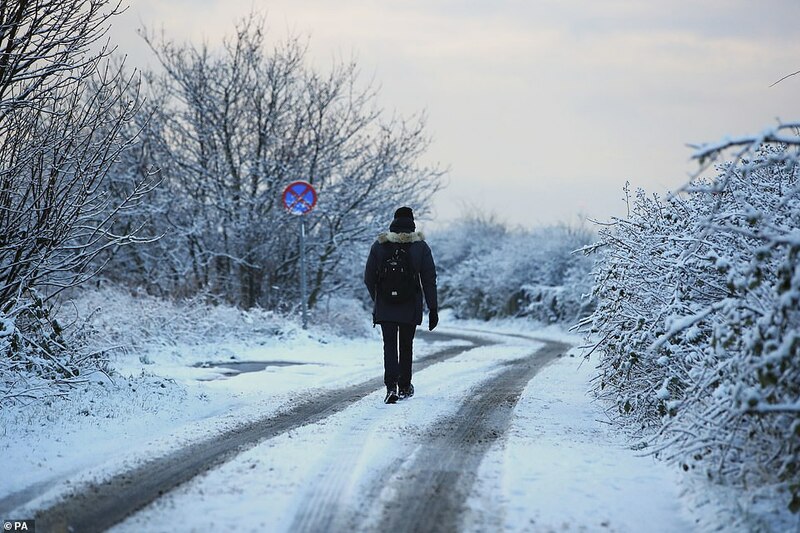 A further weather system forecast to arrive tomorrow could break this winter’s current record low of -10.8C (12.6F) set on January 18 in Aberdeenshire, and bring up to 4in (10cm) of snow even to parts of southern England. 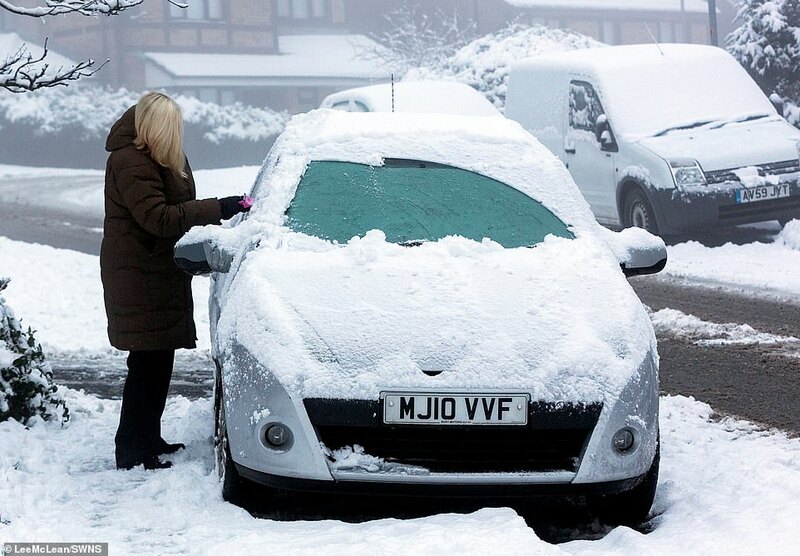 Where and when are the Met Office warnings? 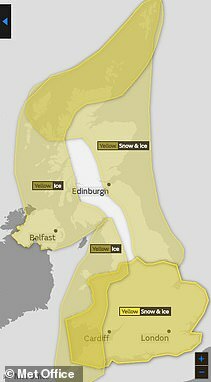 Yellow weather warnings for snow and ice covered most of the UK today, after the lowest temperature recorded overnight was -6.8C (20F) at Aonach Mor in the Highlands, followed by -6C (21F) at Topcliffe in North Yorkshire. 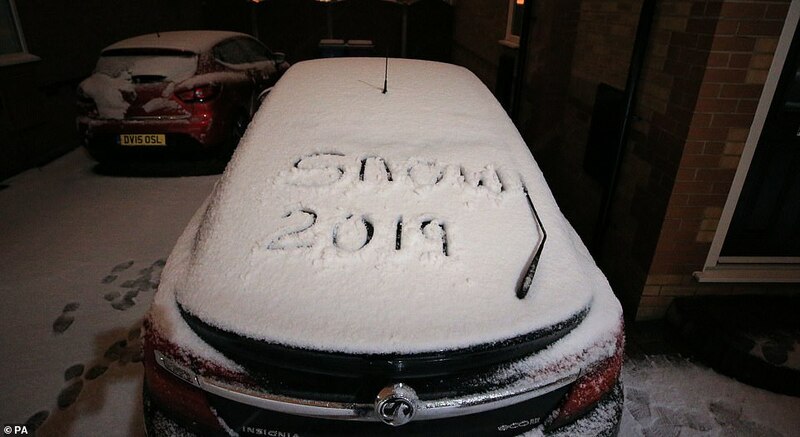 Snow fell overnight in London, but forecasters said the ‘messy’ nature of the weather front, which was a mixture of snow, sleet and rain, meant the problems it caused were ‘patchy’ and not as widespread as feared. Another weather warning is in place for much of England and Wales from 1pm tomorrow until 9pm on Friday. 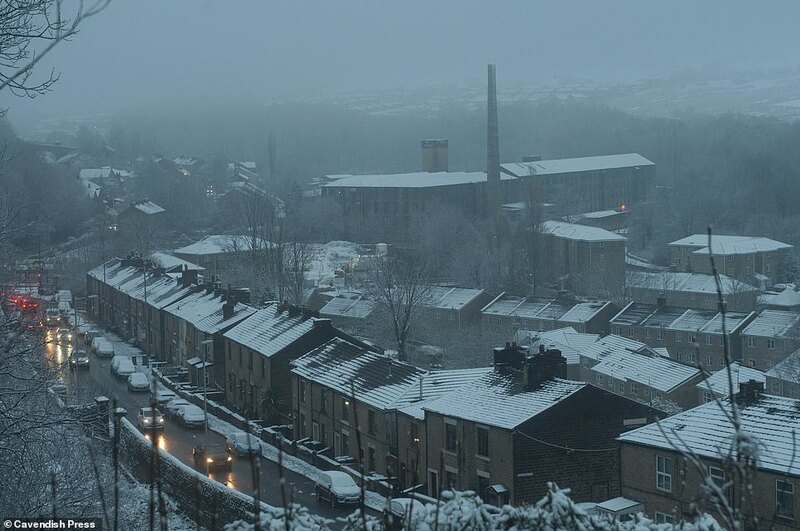 The Met Office expects a second cold front with rain and snow to sweep from West to East. 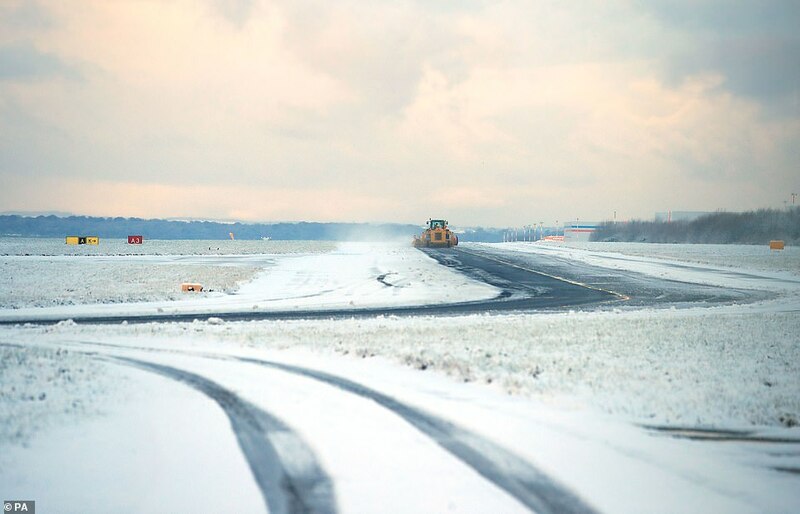 A Manchester Airport spokesman said: ‘Our airfield team has been working through the night to keep the runways clear, which resulted in the day’s operations starting as planned. 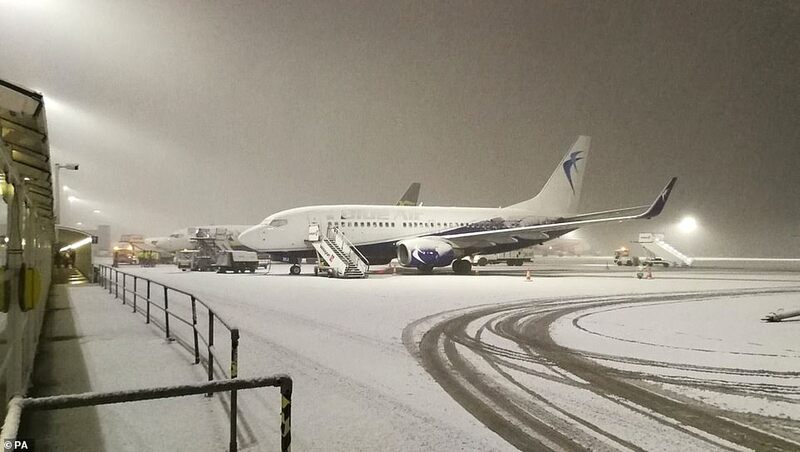 ‘However, as conditions worsened significantly this morning, we took the decision to temporarily close our runways. We continue to work to mitigate the challenging conditions and hope to minimise further impacts. 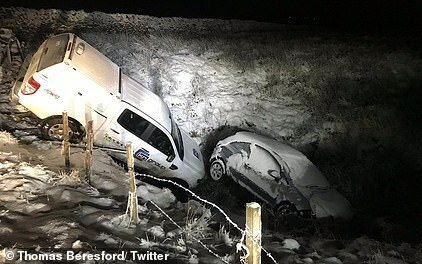 Two vehicles ended up in a canyon after accidents on an isolated road in the Yorkshire Dales during snowfall. The drivers of the cars – one of them a 4×4 – lost control while trying to get across the road between Settle and Kirkby Malham yesterday. 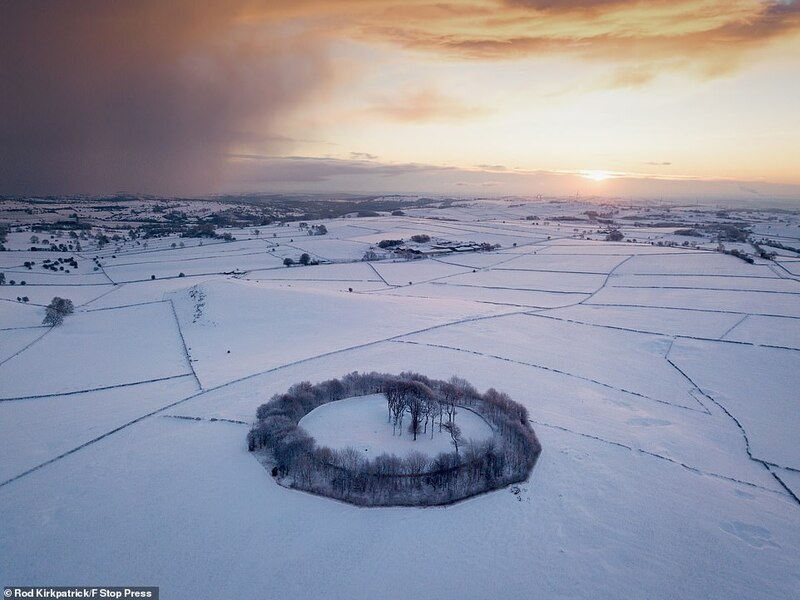 The photos were taken by mechanic Thomas Beresford, who said the road was ‘sheet ice underneath snow’. 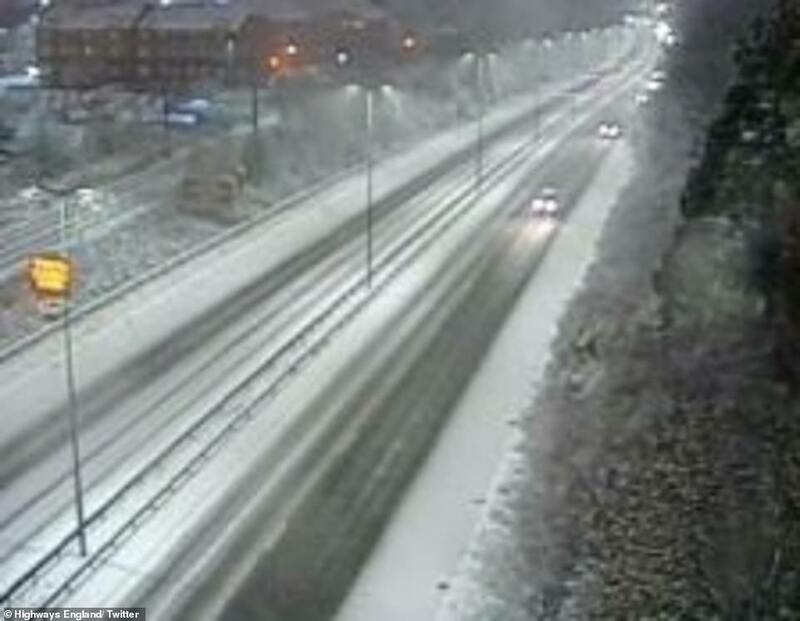 Driving conditions were described as ‘horrendous’ in Cornwall and Devon this morning as snow and ice caused at least 20 crashes. Some roads were impassable because lorries trying to climb uphill stretches could not move. Cars were ‘lightweight’ by comparison and could get up the hills – but could not inch past the stricken lorries. An entire stretch of the A30 was blocked because of stranded lorries between Meldon and Sourton Cross. To add to the rush hour chaos, a crash involving a crane caused delays for commuters near Truro in Cornwall this morning. The collision was at around 7.10am on the A39 roundabout near a Tesco store, and fuel spilt on the road. 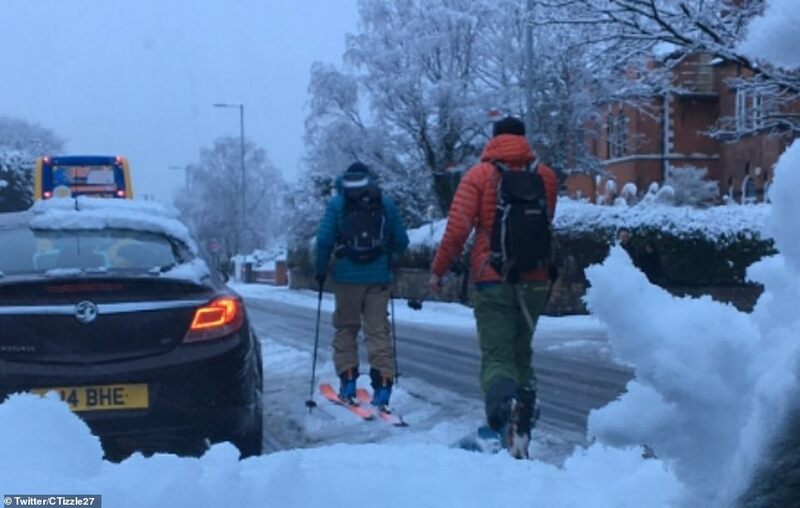 Journeys on the roads could take ‘a lot’ longer and should be avoided if possible, warned Met Office meteorologist Alex Burkill. Mr Burkill said: ‘Looking further ahead, it’s what happens on Thursday that has the potential to be more disruptive. It does have the potential to bring some very significant snow. 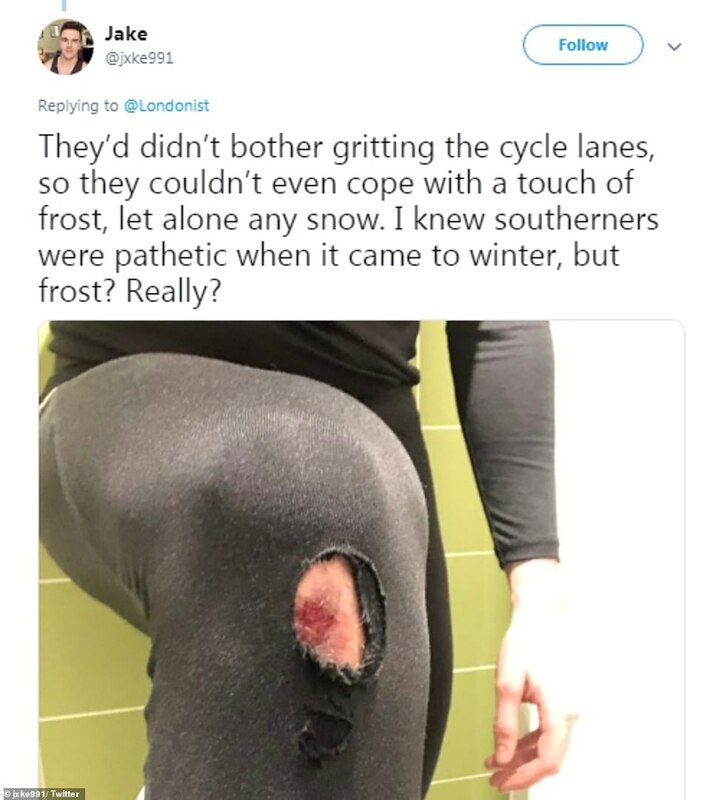 We have already got a warning out in force for it. 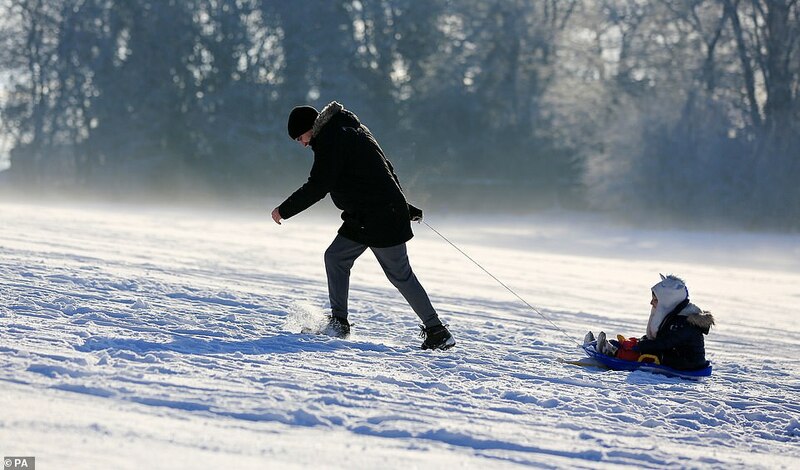 The year’s record low, recorded in Braemar, Aberdeenshire, on January 18 is also likely to be beaten. 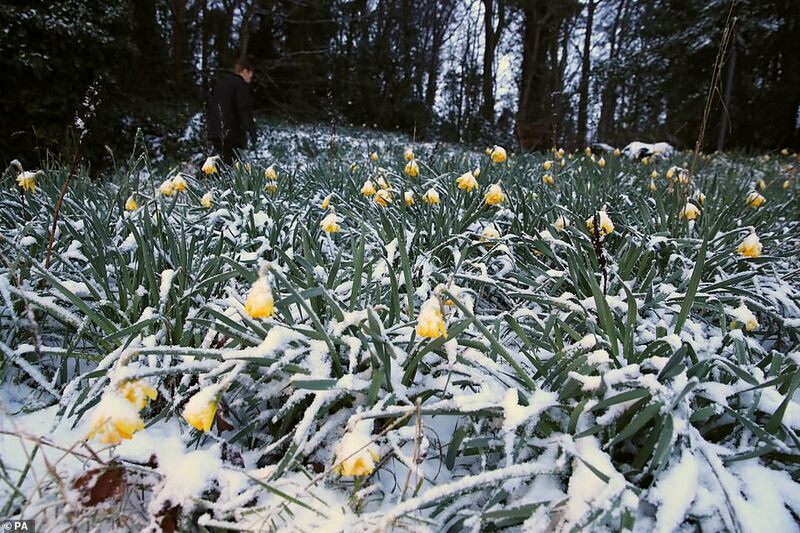 Benton, in Oxfordshire, and Santon Downham, Suffolk, are among parts of England which could be coldest. 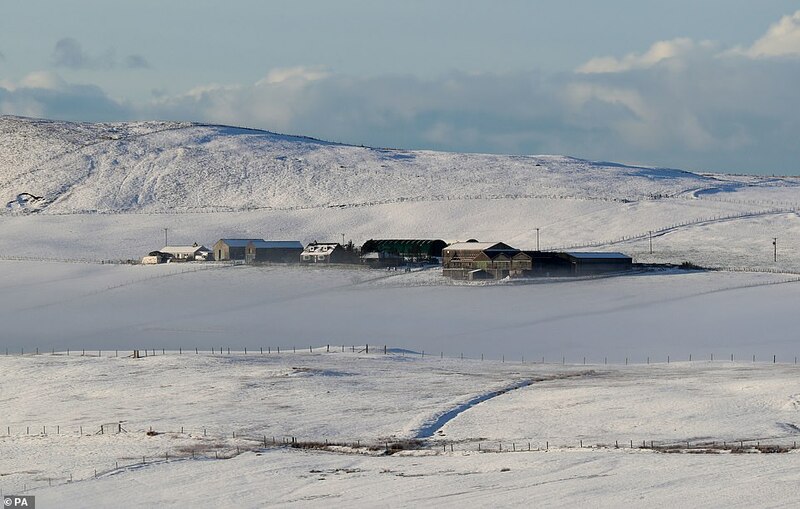 ‘I think Scotland will probably be the coldest place but it’s not out of the question we get into negative double figures in parts of England,’ Mr Burkill said. 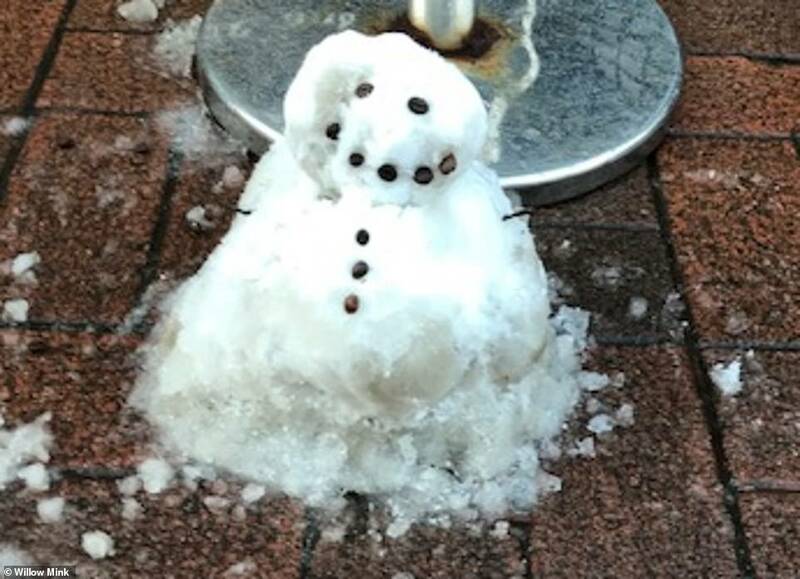 Snowfall and freezing temperatures has forced the closure of many schools across the country. 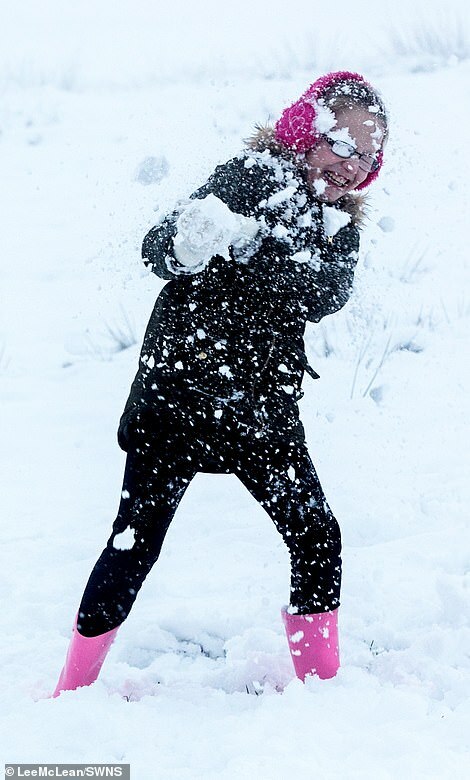 Thousands of children were granted a snow day after the wintry conditions set in on Tuesday night. Many schools and headteachers took to social media to announce the closures, with some instructing pupils on how to access their homework. 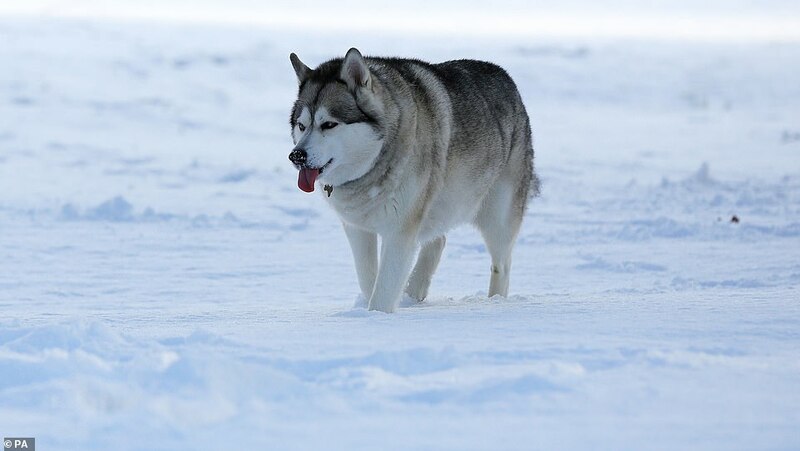 However, other tweets also told the youngsters to enjoy the weather. 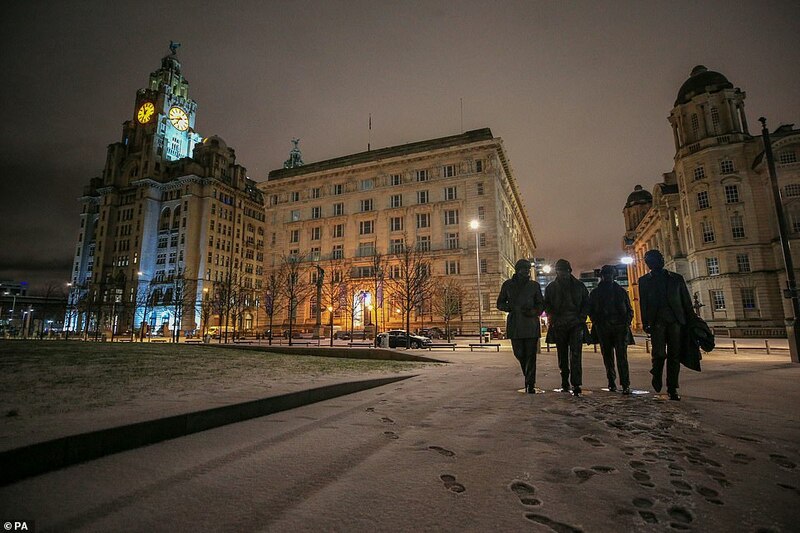 Schools across Greater Manchester closed, as well as some in Liverpool, Sefton and St Helens. Other areas with closures included Lancashire, Cheshire, North Wales, and the Highlands. 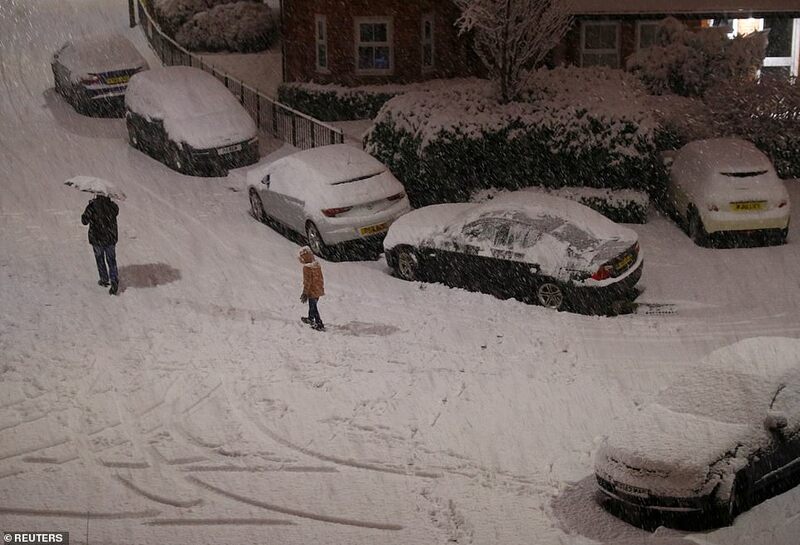 Many local councils tweeted links to their websites outlining the schools that were not open. Parents and carers wanting to check whether their child’s school was open were also able to do so through the Department for Education’s website. Upon entering their postcode they are directed to the council website, detailing all the closures. Salford City Council, where at least 13 schools closed, listed their names alongside the reasons for them being shut. These include ‘staff unable to get to school safely’ and ‘pupil safety and staff unable to get into school’. 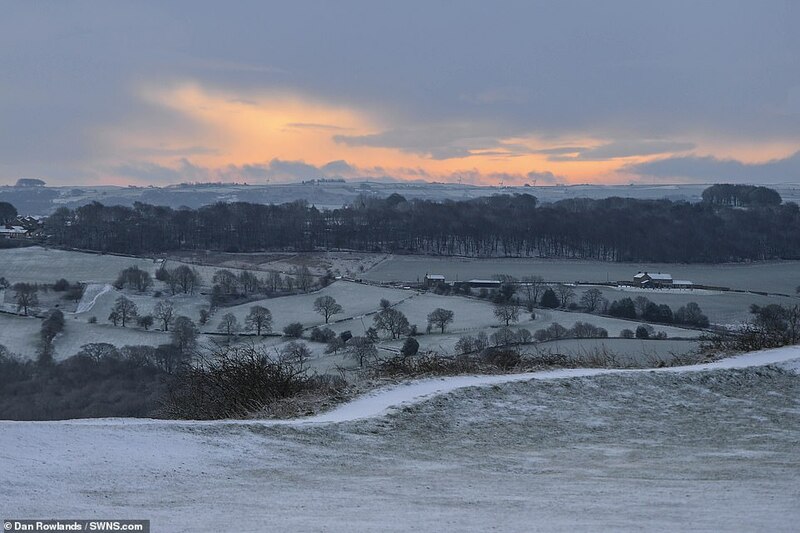 Tomorrow will start off ‘very cold’ as the weather system pushes eastwards from the South West. Areas of higher ground could get up to 4in (10cm) of snow. ‘It’s worth bearing in mind there will be some disruption, particularly to travel. 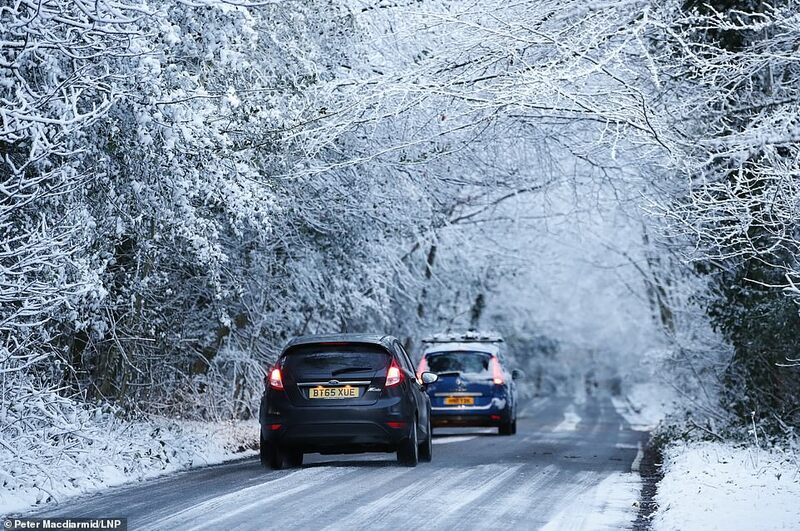 If you’re heading out on the roads, be aware your journey will take a lot longer than normal,’ Mr Burkill added. 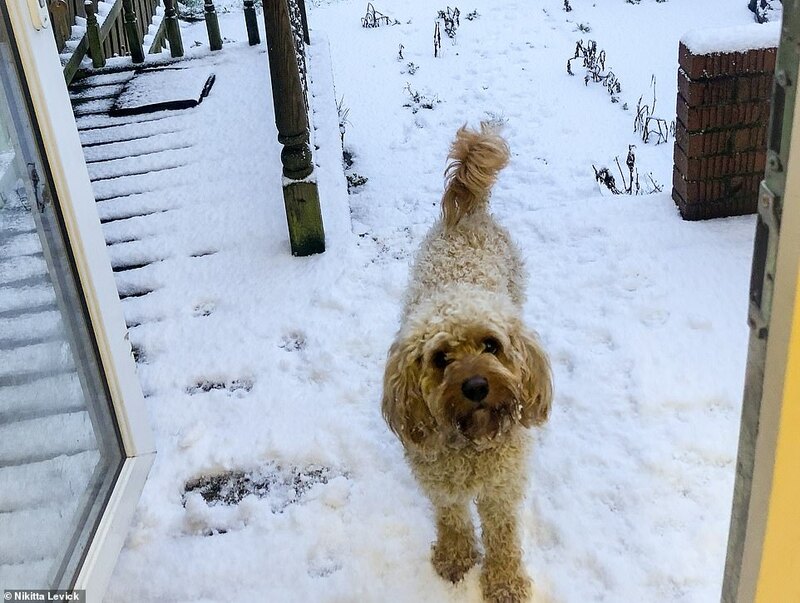 Official Met Office figures for snowfall yesterday showed the worst-hit areas were Tulloch Bridge, Inverness-shire, with 4.3in (11cm), and Spadeadam, Cumbria, with 4in (10cm). 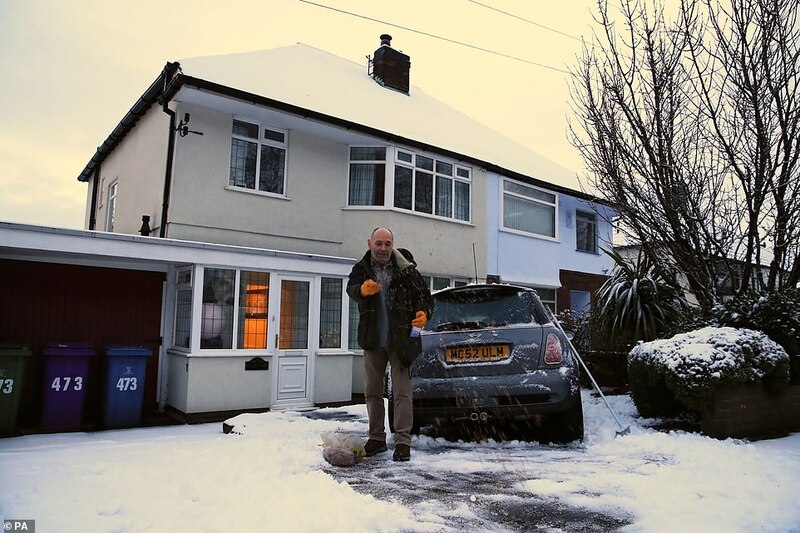 Councils have prepared for heavy snowfall, with more than 1.4million tonnes of salt stockpiled, the Local Government Association said. 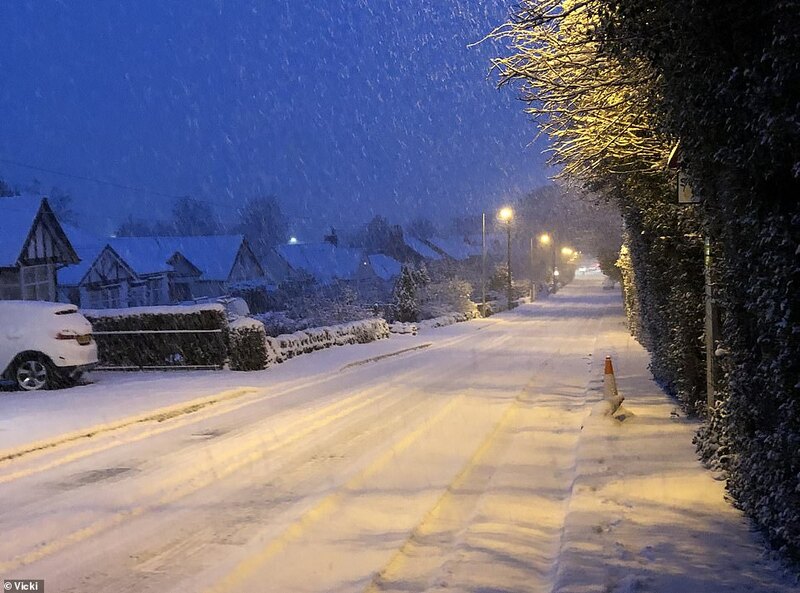 And a spokesman for Bolton Council, where seven schools closed today, said this morning: ‘Care workers are carrying out home visits on foot this morning to make sure everyone is seen as planned. 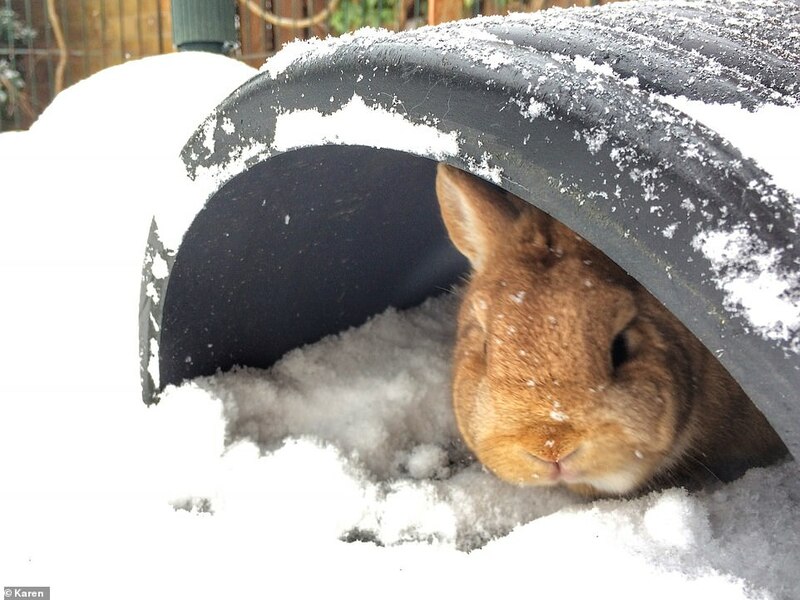 ‘We’re sorry, we’ve had to suspend waste and recycling collections today due to the adverse weather and the topography of the area. Age UK is advising vulnerable and elderly Britons to stock up on medicines and ensure they have plenty of food at home. The charity suggests keeping blankets, food and a shovel in the car, torches in case of a power cut and emergency numbers at hand. 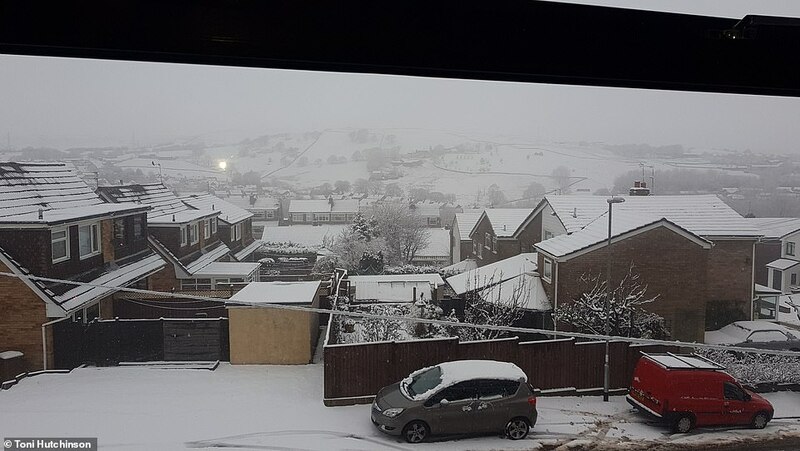 Yesterday, there was a blanket of snow on higher ground in Wales, the Peak District, Cumbria, the Scottish Highlands and the Pennines, and cars became stranded on roads near Aberystwyth. 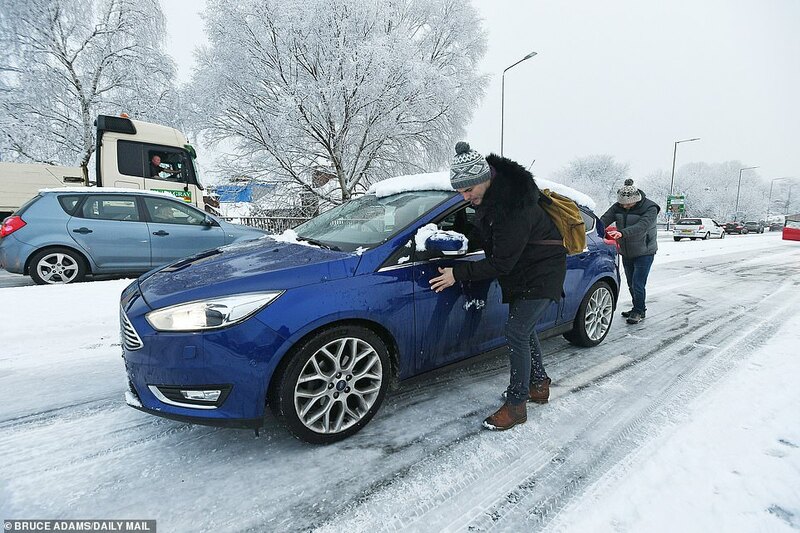 Today, vehicles were stranded on the A38 between Whiddon Down and Okehampton on Dartmoor. 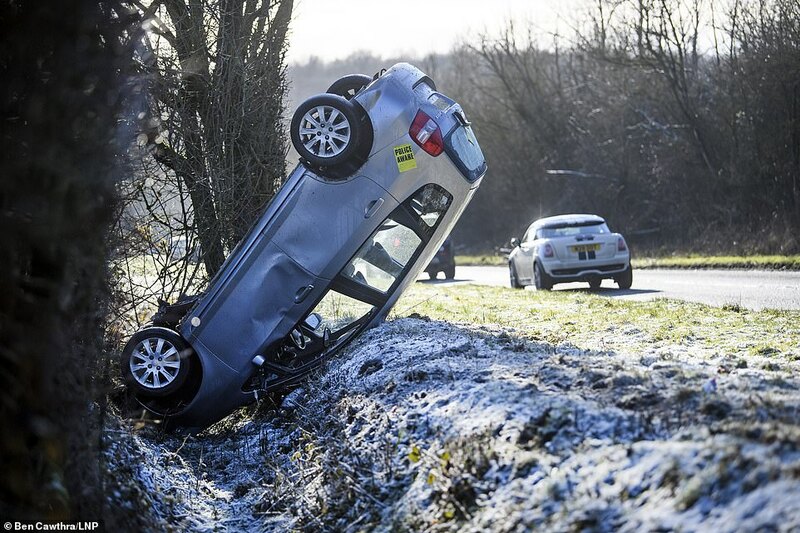 Devon and Cornwall Police said there were more than 20 driving incidents in an hour yesterday morning – mostly in Devon. 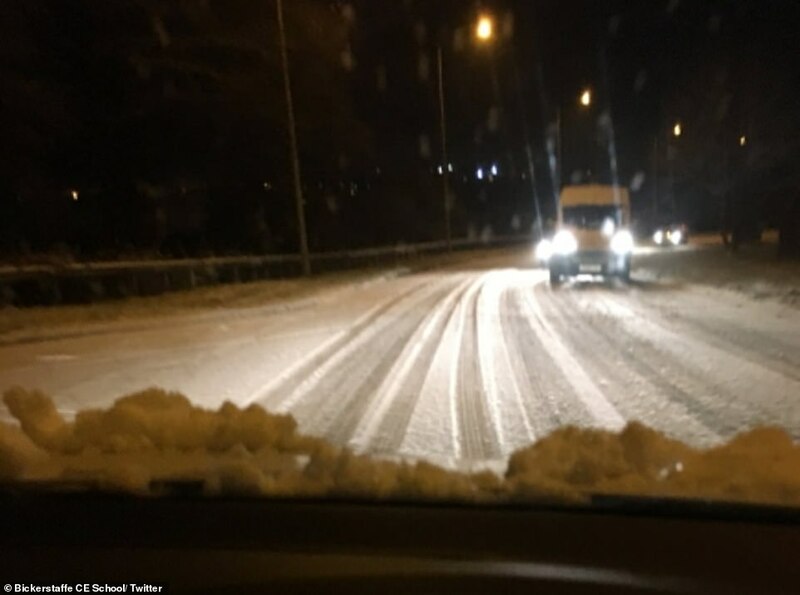 Schools across North Wales were forced to close while police urged motorists to avoid Blaenau Ffestiniog due to the appalling conditions. 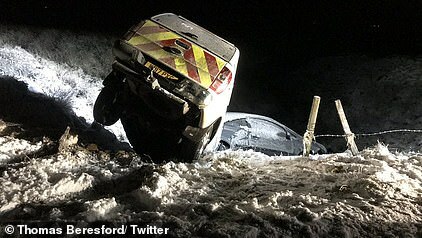 A car overturned on the M6 near Shap in Cumbria, where the thick snow caused chaos. 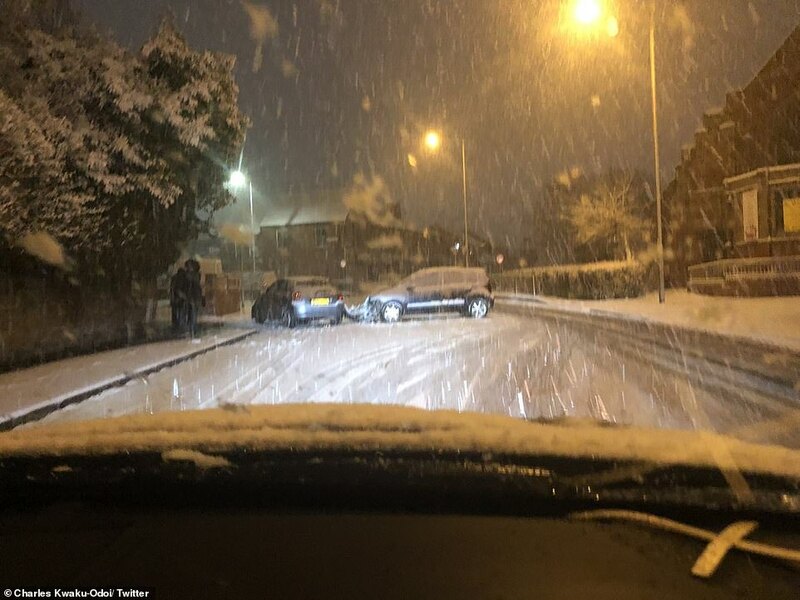 Meanwhile, police in Scotland caught one motorist driving a snow-covered car with just a small square of windscreen cleared to see through – and the vehicle’s rear and side windows completely covered. Pictures of the car were posted on social media by police before the driver was stopped in the Scottish Highlands and given a fixed penalty notice. 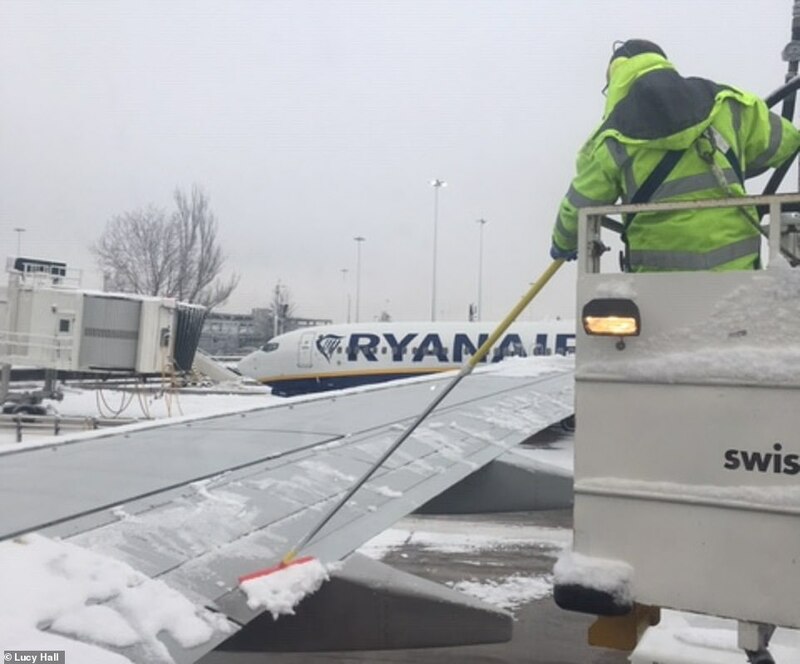 A low pressure system affecting France – named Storm Gabriel by the French – is sending moisture over Scotland, which turns to snow as soon as this hits the cold air flow. 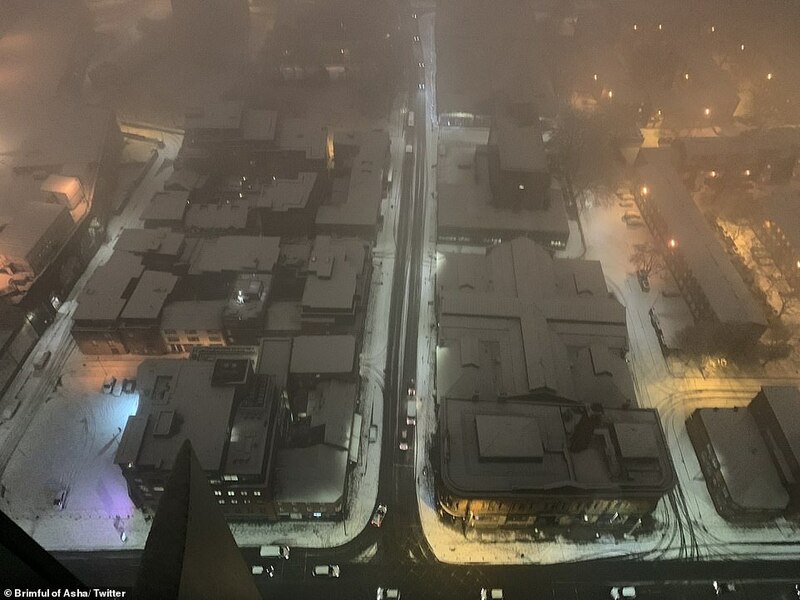 Yesterday, thousands of motorists were held up as a blanket of snow arrived in time for the morning rush hour. 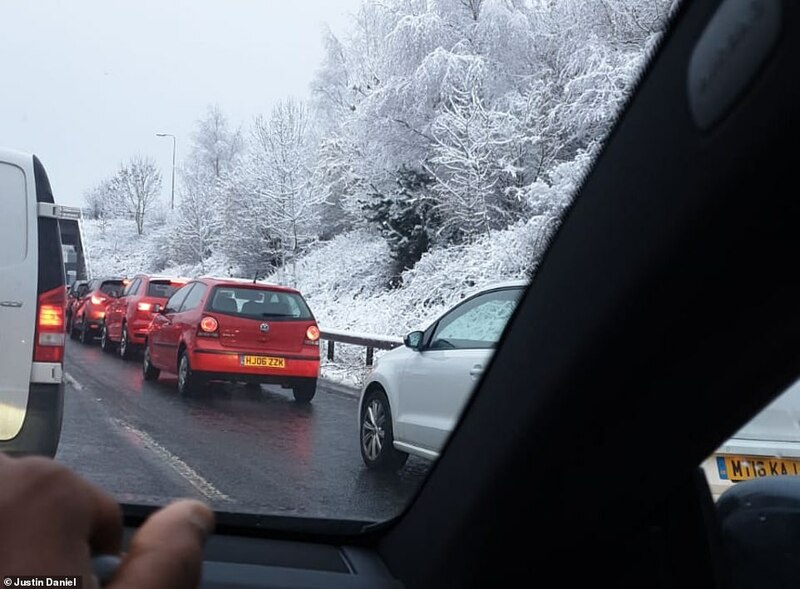 The M77 was jammed from Ayrshire to Glasgow city centre as snow settled. A pre-arranged wide load was escorted along the M8 – despite the yellow warning – resulting in tailbacks at Blackburn and Livingston, West Lothian. 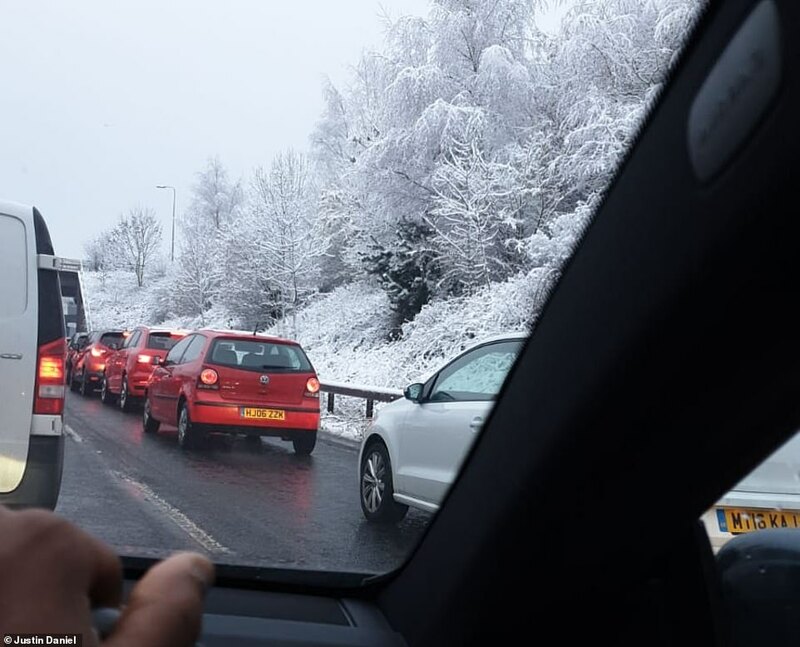 At Kirk O’ Shotts, Lanarkshire – the highest point on the M8 between Glasgow and Edinburgh – an accident blocked one lane of the eastbound carriageway. 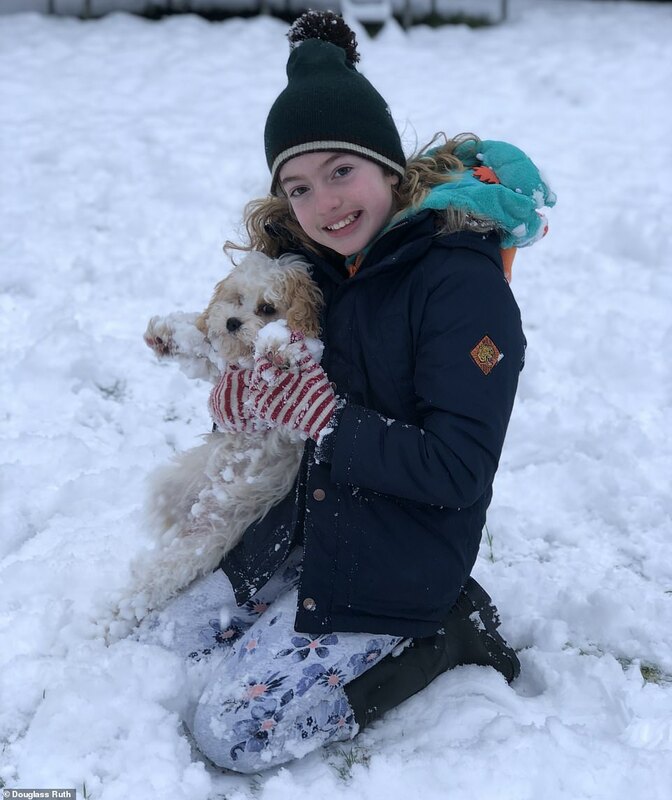 More than 300 pupils in the Highlands had a day off school due to the snow, with two secondaries and eight primaries closed. 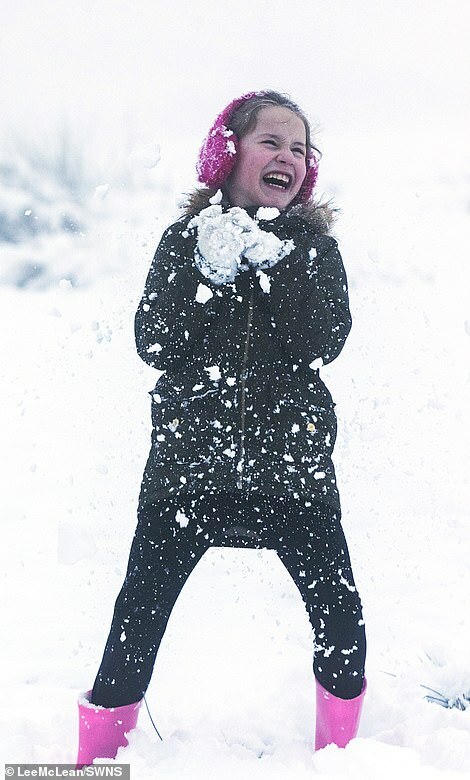 Farther south, schoolchildren in Lanark made their way to classes amid heavy snowfall. 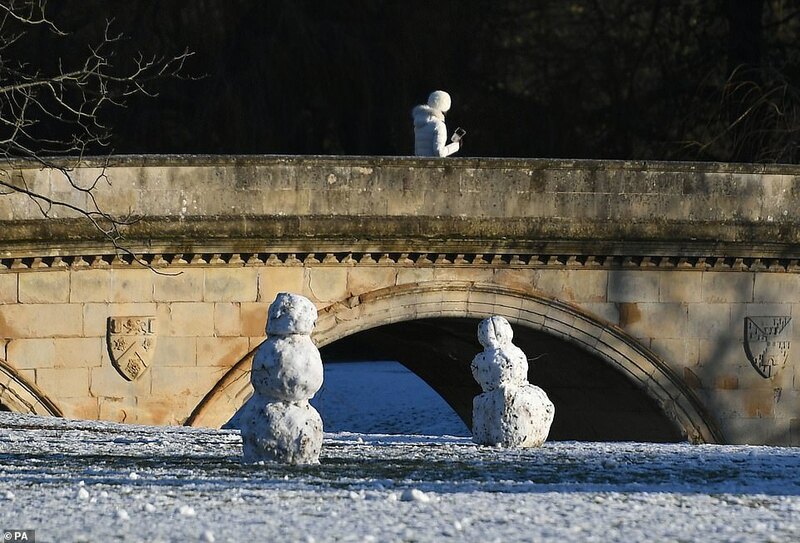 With a severe weather warning in place across London last night, there was a good chance that the capital might have had its first significant snow in a year. 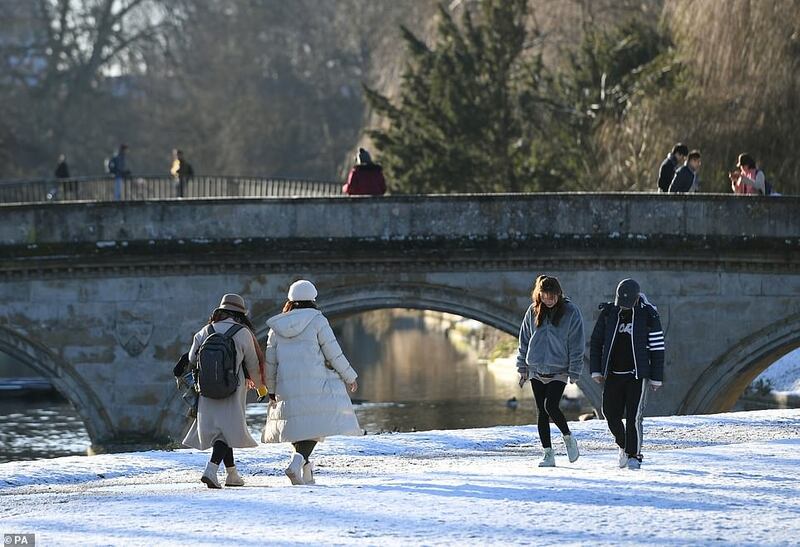 But these hopes were dashed as Londoners woke up this morning to a distinct lack of the white stuff – despite a frosty start after the occasional flurry overnight. 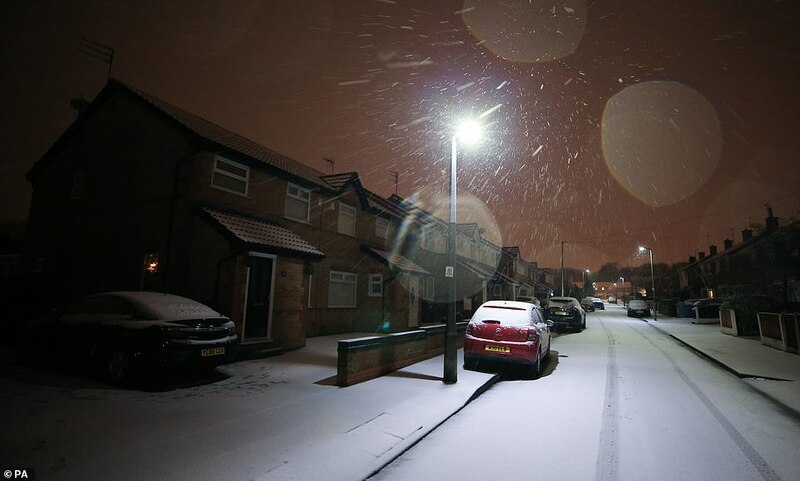 Snow flurries had been forecast for London, which was within a Met Office severe yellow warning area overnight, but they had not been expected to settle. 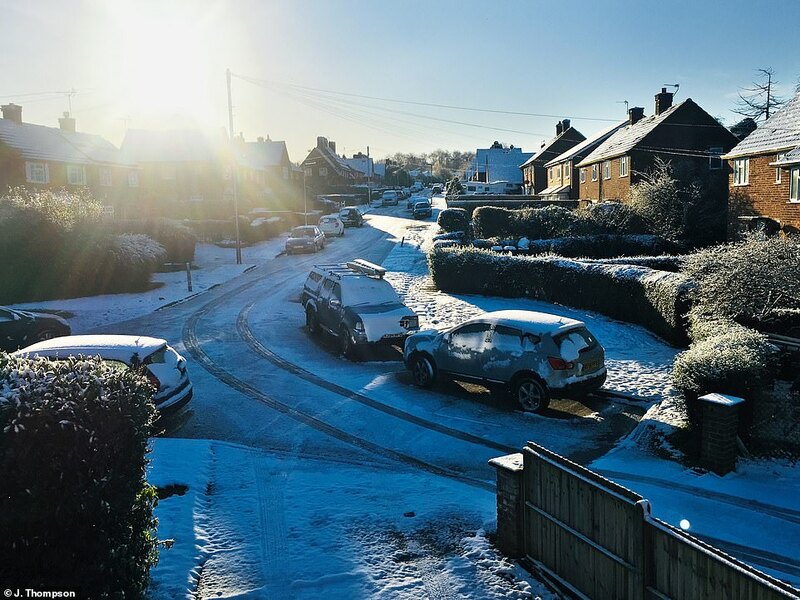 Forecasters said the ‘messy’ weather front – a mixture of snow, sleet and rain – meant the problems it caused were ‘patchy’ and not as widespread as feared. 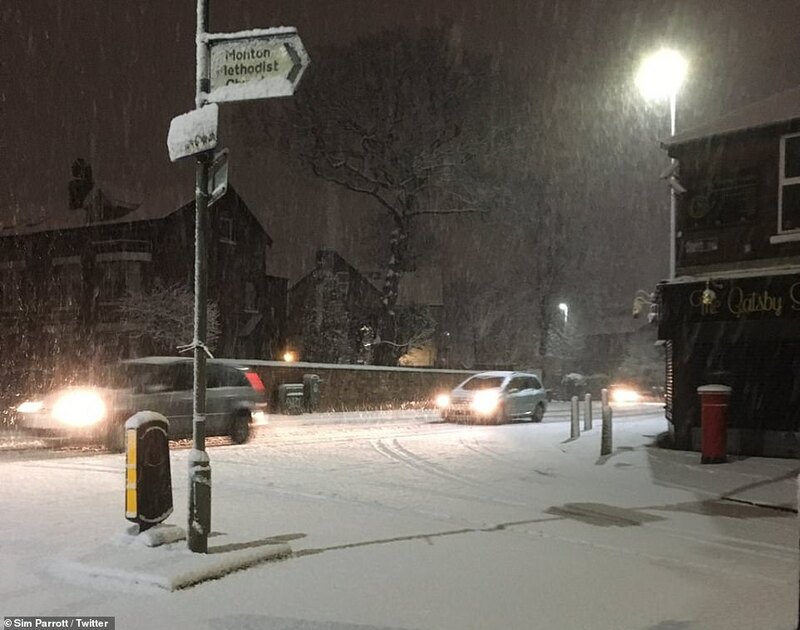 But there will be a further chance of snow disruption from tomorrow night when London is again under a Met Office weather warning for severe conditions. 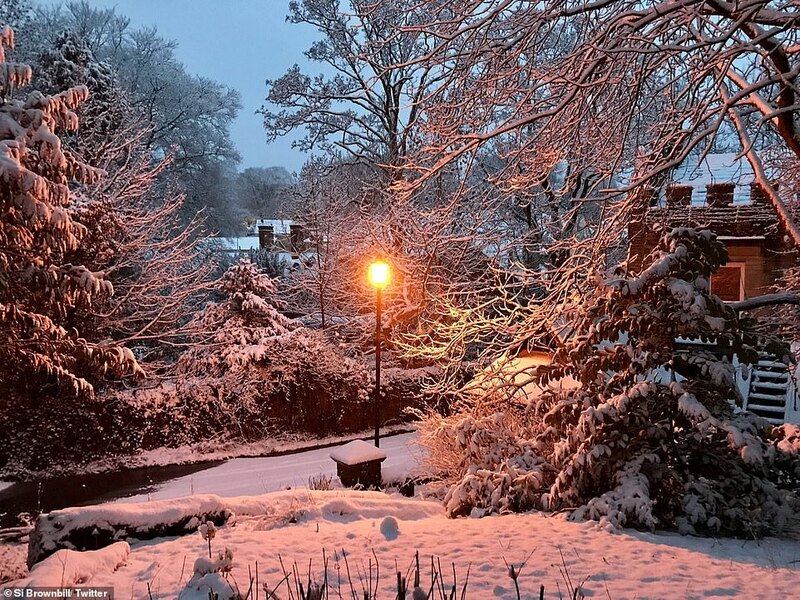 It’s been the first significant snowfall of winter for many parts of Britain. 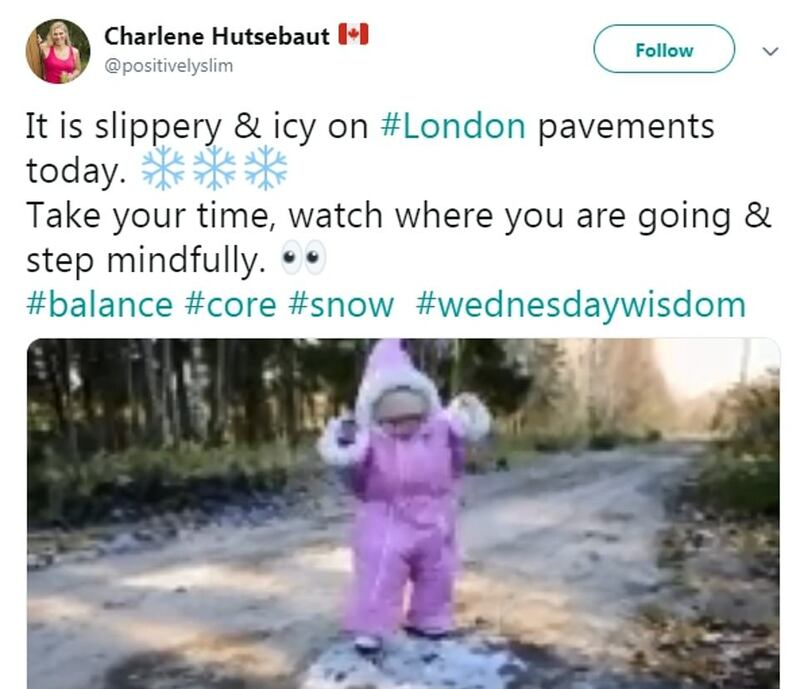 And MailOnline readers were out in force today taking pictures of the wintry scenes across the country as many parts faced dangerous travel conditions. 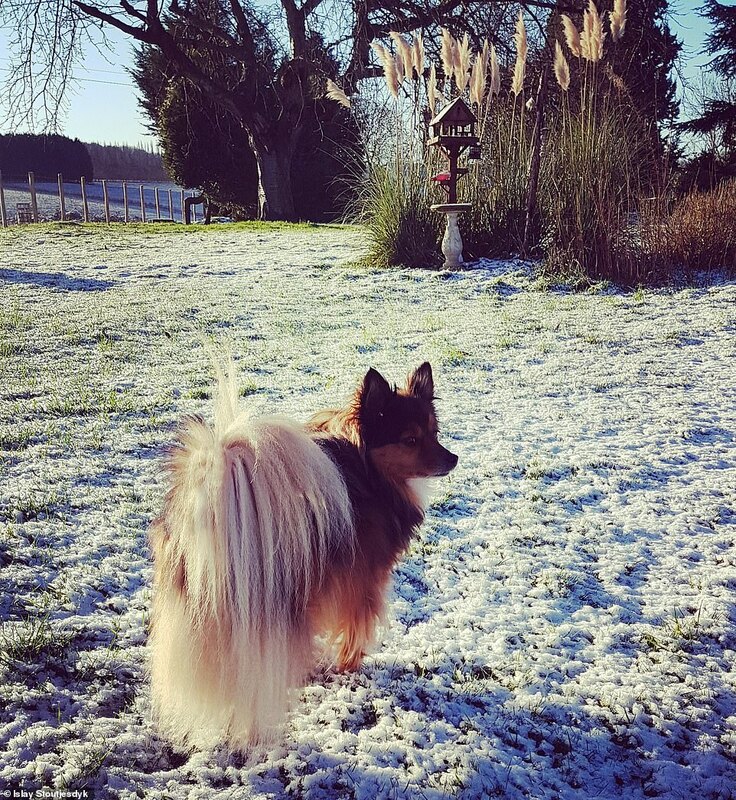 Others took pictures of their pets investigating the snow as the country braced for further snowfall over the next two days amid possible -11C (12F) temperatures. 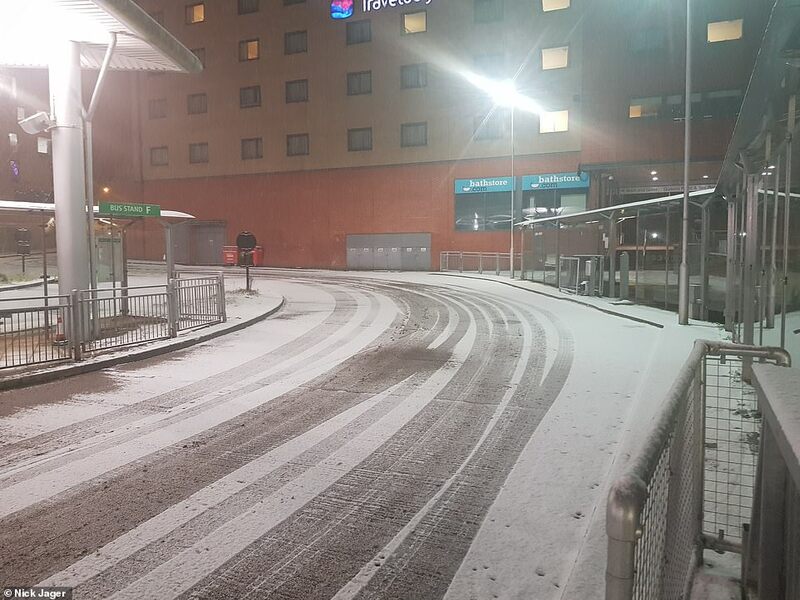 Snowfall brought Manchester and Liverpool airports to a standstill this morning as many schools in the cities closed their doors owing to the harsh conditions. The disruption is set to deepen with a weather system arriving from the south west and pushing north tomorrow. The next warnings are in place from 3pm.